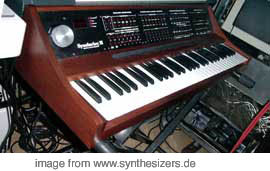 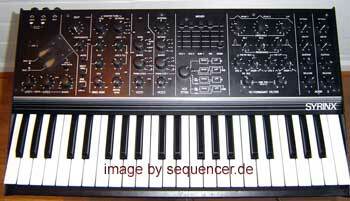 Das Moogulatorium...the SPECIAL STUFF.. / die BESONDEREN..
Synclavier.. FM Synthesis & more..
read the manual "why a synclavier has no midi" ;-)) NED: new england digital. 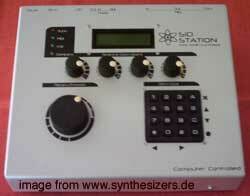 hi end FM and sampling station, better run it with a mac for editing.. NED Synclavier again. 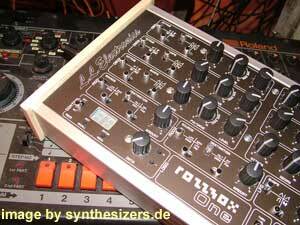 resynthesis, 12 OP FM, sampling is possible on this machine. 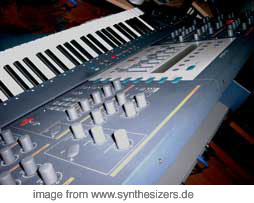 you may have heard one @ depeche mode, kraftwerk or other ,even non-electronic-sounding groups/musicians. 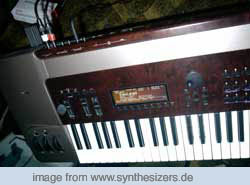 NED NED Synth overview / überblick..
this machine was maybe the most expensive (digital) gear in the 80ies.. 0.5secs samples, additive and resynthesis (no, it's NOT like the k5000 and the cube.. but maybe inspired), after this PCM sampling like in the korg M1 and D50 samples became very popular..
the fairlight was a complete system with sequencer controlled by lightpen, 2x 8" floppy discs, and midi (not like the midi-less synclavier)..
Fairlight CMI Fairlight Synth overview / überblick..
a digital Synthesizer that could only be programmed via a Kaypro Computer attached to it. 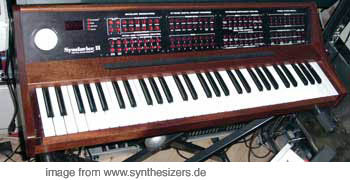 The Kaypro was a quite "normal" Computer at that time, today it is very exotic of course..
check this page for special systems like symbolic sound kyma , harmann neuron and neuronium resonator here! 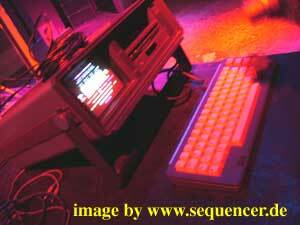 want a closeup movie?? 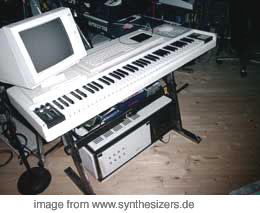 willst du einen kleinen "WAVE-Film" sehen? 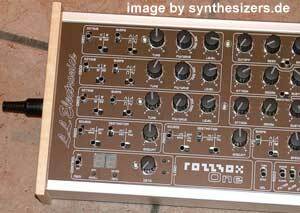 only 25 were made in the mid. 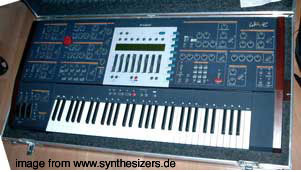 80ies. 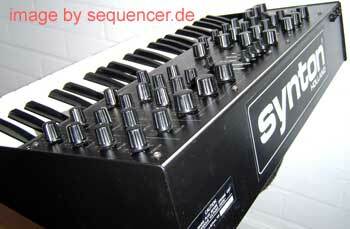 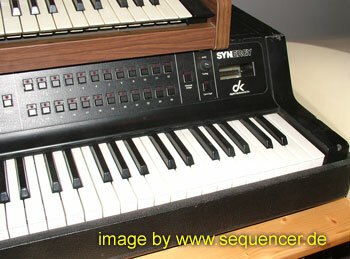 this one simply sends SysEx Strings via Midi. so one can connect any DX7,TX7 or TF modules of a TX816..
Ensoniq is now owned by E-Mu (they are owned by Creative Labs).. in fact it is dead..
find more on transwaves and the like..
interesting minimal step sequencer beside LSDJ.. info in the SOFTWARE section..
well, call it a "laptop" version of the commodore c64..
with built in 1541 floppy drive and CRT screen..
this is the heart of the commodore C64 homecomputer from 1983 - the SID chip, a real analogue synthesizer with 3 voices: ringmodulation, ADSR envelopes, PWM for a real lowfi sound..
the sidstation has some additional features..
eg: "wavetables".. and 4 controllers.. not cheap! 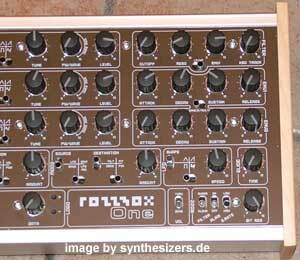 but possible beside the ucapps C64 a nice way to use it as an instrument..
Rozzbox is a one man small "company". 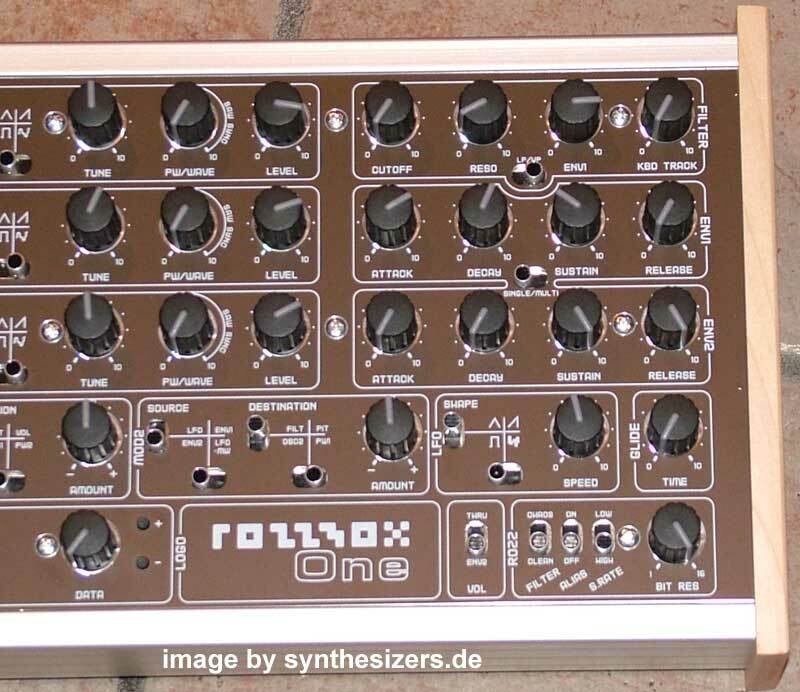 it all started to make a nice digital synthesizer for about 250€ on microcontrollers/pic - to make it cheap and no need for DSPs or the like..
todays music lives from the digital imperfection here.. so you can turn up digital dirt in a special section "rozz (rotz!)" 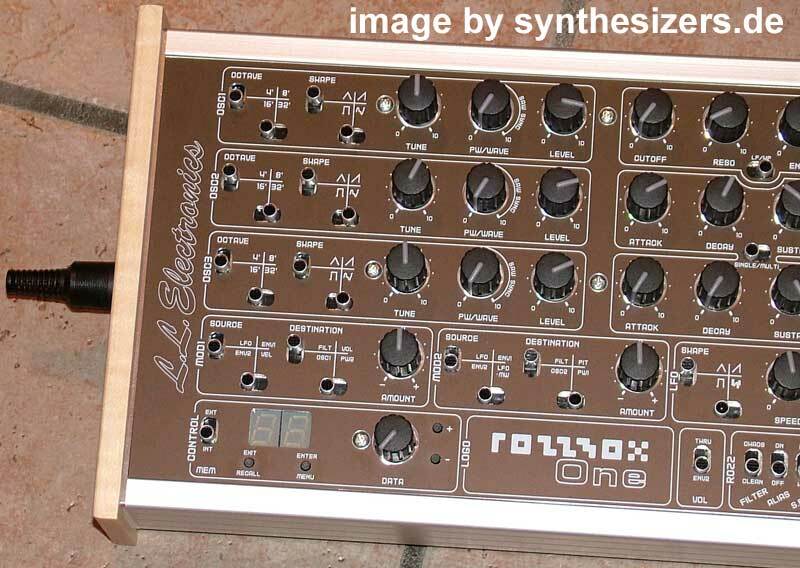 and reduces bits and depth of calculating filters / aliasing is WANTED..
so, yes.. it is not an 8bit C64 synth, but it was designed for lofi sounds.. in fact the Rozzbox ONE sounds much more hi-ended then one might think of. 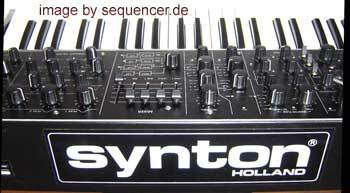 additional to this there is an analog filter available as an option. 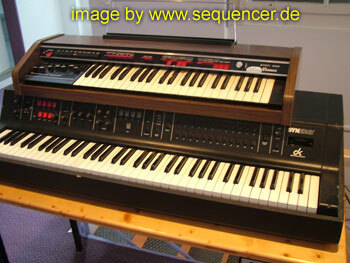 it has 3 OSCs feat. 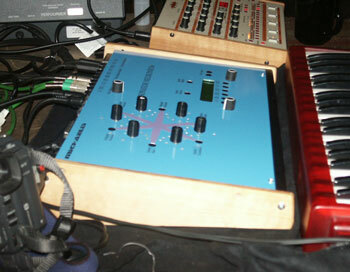 digital waves also and an LFO and 2 "mod matrix"-kind of routing sections. 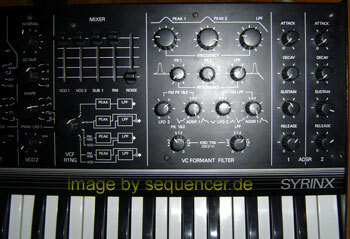 the filter is LPF or HPF with resonance, oscs range from 4 to 32". 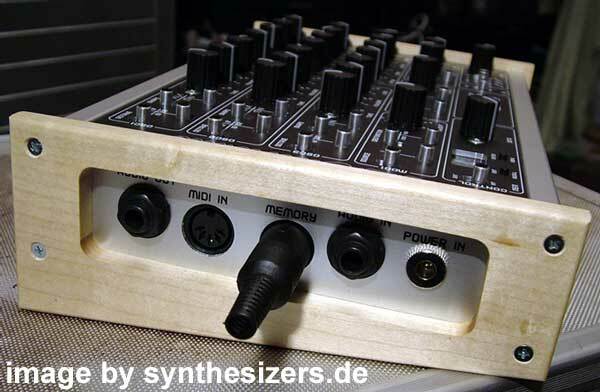 there is a small display for saving your sounds and there are of course 2 ADSR envelopes. 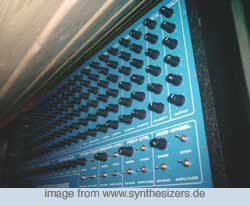 rozzbox / ll LL Synth overview / überblick..
hartmann neuron QT - movie and info..
most are black.. but there are some blue, red, possibly some "lila" ones, too .. and it has a strange controller "mod pad"
Vermeulen) in Holland even keyless expanders in the 90ies. 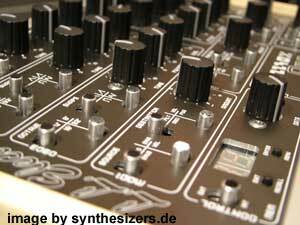 the controllers are quite special "plate layers" that can be pressed to mod the pitch of each VCO or both (not when in sync/softsync). also: you can control VCF or/and the VCA by those 2 "pads"..
so it is a quite flexible unusual synth. 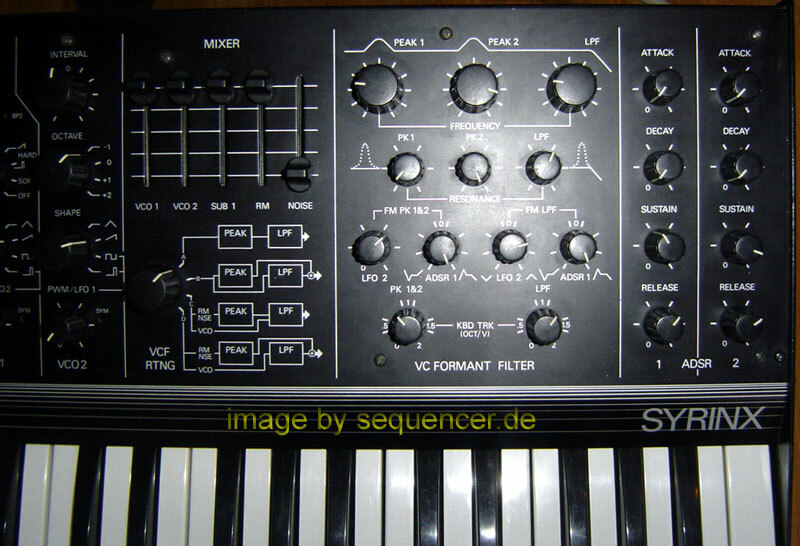 it is not THE bass synth, but it can do, of course.. for it's filter setup is interesting for larynx-like sounds..
very special machines can be found here..
for converting and lots more.. maybe interesting for modular systems and very special systems..